THE BAD - Slow pacing and some forced reactions make this for a long 107-minute watch. ​​Being a British soldier during WWI is a lot like playing a life or death game of Hot Potato. They jump from place to place, praying that when the time comes for their scheduled six-day stay at the front-lines, the music doesn’t stop. 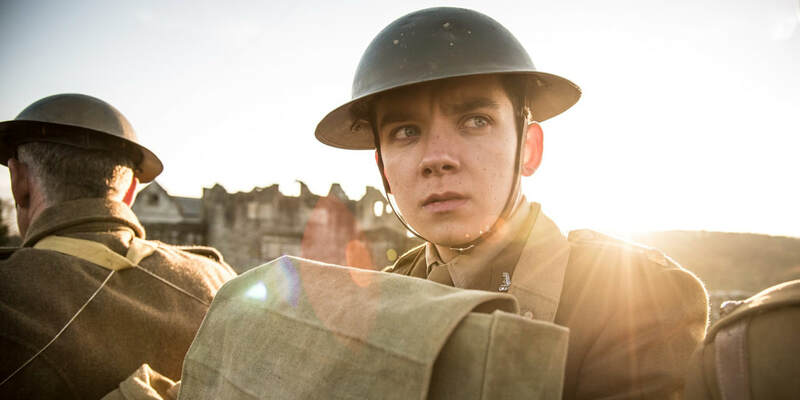 “Journey’s End” isn’t a film about the music stopping so much as one of the grueling days up to it, and the emotional turmoil that these young soldiers endured. Based on the 1928 play of the same name, the film adaptation successfully realizes the bleak mood and pinched nerves evident in these dire trenches as their stresses rise and hopes fall. Directed by Saul Dibb of 2008’s “The Duchess,” “Journey’s End” sees C-Company arrive for their six-day stay in the Saint-Quentin trenches. Helmed by a jaded Captain Stanhope (Sam Claflin, “Me Before You”) whose way of coping with the wearies of war is via a bottle of whiskey before bed, C-Company is not eager for the coming days. Joining Stanhope is his Second in Command, Lieutenant Osbourne (Paul Bettany, “The Da Vinci Code”), Second Lieutenant Hibbert (Tom Sturridge, “On the Road”), Second Lieutenant Trotter (Stephen Graham, “Taboo”), the cook Mason (Toby Jones, “Tinker Tailor Soldier Spy”), and a newcomer to the company — but an old friend of Stanhope’s — Officer Raleigh (Asa Butterfield, “The Space Between Us”). Taking place over the span of four days, the men of “Journey’s End” bide their time with stories, drinking, and anything to temper the overwhelming anxieties boiling within them. “Journey’s End” is nothing new. It’s a property, quite literally, told over and over, whether it's the 1928 R.C. Sherriff play or its 1930 original film adaptation; it’s been done before. Even if you’ve never heard of the play, you’ve heard of the overall story— a battle-hardened Commander leads his men into an impasse scenario, a wide-eyed new recruit is eager to make something of himself... it’s a tale as old as time. However, that doesn’t necessarily make it stale. “Journey’s End” isn’t original, but it is riveting. Any film that takes place entirely in one setting already has a hurdle to cross, as it has to keep the attention of viewers without any flashy scene transitions or new locations, but it’s a style that audiences seem to love— “Rear Window,” “127 Hours,” and “The Breakfast Club” are only a few of the very successful films set in one area. “Journey’s End” joins these successes, as its cramped quarters beget tension and its tension begets reactions. In fact, the searing tension throughout this film would seem overbearing if not for the varied ways in which the characters express it. Claflin’s Stanhope swallows his tension whole with a whiskey chaser, resulting in a constant expression of distaste and despair. Lieutenant Osbourne, while cool and collected, handles his by focusing on those around him. Paul Bettany plays Osbourne with compassion and a saddened sense of wisdom. Feigning illness is how Second Lieutenant Hibbert gets by with his tension, something that Captain Stanhope truly reviles and ultimately results in a near gun fight. And then there’s Officer Raleigh, who doesn’t quite understand the tension of the others— he’s walked into a bear trap thinking it’s a reunion party, and his hopeful demeanor only emphasizes the abjection of it all. Further, the cinematography is simple but encompassing. Cinematographer Laurie Jones shaded “Journey’s End” with grounded blue hues and never lets us forget how decrepit the trenches are with shots of muddied boots and rotting woodwork. It’s an unforgiving climate and Jones refuses to let the audience escape from seeing that death and dirtied blood is all these front-line trenches know. The framework of “Journey’s End” is in its performances. What could’ve been an overacted and disingenuous cast became one with heart and deafening authenticity. Sam Claflin is enthralling as the belligerent and haunted Captain Stanhope. His frequent drunken outbursts and loud demeanor towards his men, particularly the poor abused cook Mason, are uncomfortable to watch and filled with anxiety. He’s been through hell and it shows, both in his mannerisms and hallucinations. Stanhope is experiencing PTSD sixty years before it was given a name, and it’s only made worse by the arrival of his old friend and lover’s brother, Officer Jimmy Raleigh. The silence and pain that covers Stanhope’s face at Raleigh’s arrival is louder than every eruption of noise he makes. Paul Bettany and Asa Butterfield are not to be forgotten as the clear-headed Lieutenant “Uncle” Osbourne and optimistic Officer Raleigh. Bettany is unafraid of taking a back seat to Claflin’s Stanhope, and he’s a much-needed companion. While in no way naive, he keeps spirits high with a “carry on” attitude and attempts to make the most of his time in the trenches. He takes Butterfield’s Raleigh under his wing and shows him the hospitality that Stanhope so vulgarly lacks. Though Butterfield doesn’t have much dialogue to manipulate, he bewitches the viewer with his optimism and good-natured outlook. He has joined this Company purely to be reunited with Stanhope, with whom he went to school and viewed as an older brother. He’s met with disdain and resentment from the Captain, but instead of returning Stanhope’s hatred (Which is fueled by guilt), he continues to revere the man, even writing a letter to his sister underlining the fact that Stanhope is a great and beloved Commander. For all its good, though, “Journey’s End” is long. Painstakingly long. While due in part to the grating four-day timeline, it’s still a hard sit-through. Lacking in real action until the last twenty minutes of the film, you’re left with the tension and conversations of the cast, and while for the most part, these are all well-done, you’re still acutely aware of the 107-minute countdown. Several scenes drag on for no other reason than to purposely make the viewer anxious, versus organically creating an anxiety-ridden scenario. These moments feel forced and unnecessary, as we’re already invested in the bleak and unforgiving environment of the trenches. Considering the length, one would expect the story to be fully fleshed out, but there’s definitely sequences that come out of nowhere, with no lead-in; most of the scenes between Stanhope and his commanding officer play out this way. They look almost as if spliced into the wrong movie. There’s a fine line between creating discomfort for the sake of the story or simply causing confusion, and “Journey’s End” tends to cross that line.